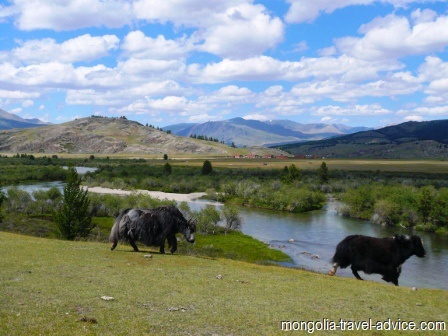 There are over 4,000 rivers in Mongolia, known as Gols in Mongolian. Most of the country's 20 or so significant waterways are in the Northern Arctic Basin in Central and Northern Mongolia, which has the highest annual precipitation. Mongolian rivers are subject to seasonal flows, and have far greater discharges during the summer, when rainfall increases and snows melt. During winter, most rivers in Mongolia freeze over, and often serve as roadways! In the East, some rivers flow into the Pacific Ocean, while to the West and South most water simply drains into large salt lakes and evaporates. I've listed the rivers in Mongolia by their three separate basins, as this is the easiest way to understand the direction of their flows. The Northern Arctic River Basin is created by the Khangai Mountains of Central Mongolia, and the Khentii Mountains near Ulan Bator. A number of large rivers in Mongolia are all contained in this basin, and drain into the mighty Selenge river. The Selenge River is the largest river in Mongolia. It swells as it heads through its huge watershed covering most of Northern Mongolia, before crossing the border into Russia (at the city of Sukhbaatar), and eventually draining into Lake Baikal (visitors on the Trans- Siberian train Will see this lake, the world's largest freshwater lake by volume). The only river draining from Lake Baikal is the Angara river (at Irkutsk), which turns into the Yenisey, which heads north all the way up through Russia before draining into the Arctic Ocean. The Selenge-Angara-Yenisey is the world's 5th-longest river system! The Orkhon, a large river itself which forms in the Khangai Mountains near Karakorum in central Mongolia. The Tuul river starts in the Khentii Mountains near Terelj National Park and flows through the capital, Ulan Bator, before joining the Orkhon. 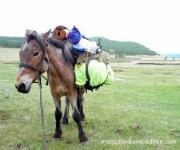 The Tuul was of spiritual significance to ancient Mongols (Genghis Khan camped and prayed by it) but today is being increasingly polluted downstream of Ulan Bator. The Ider river starts near Uliastai far to the West before joining the Selenge. Because of its own imense length, the Ider is considered the ultimate source of the Selenge-Angara-Yenisey river system. 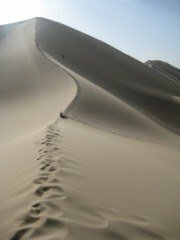 Colin Angus gives an entertaining account of his intrepid descent of the entire river system, from Mongolia to the Arctic, in his book Lost in Mongolia. 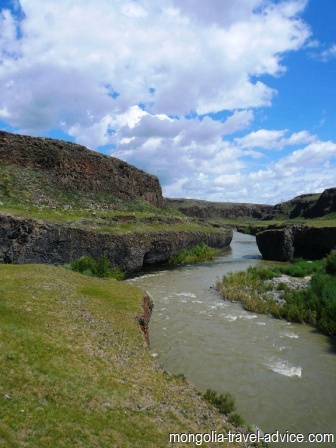 The Chuluut river starts in Central Mongolia and winds its way north meet the Ider river before it joins the Selenge. The confluence of the Ider and Chuluut rivers, and the nearby confluence of the Ider, Delgermoron, Bugsei and Selenge rivers (the 'five rivers' area), make good fishing spots. The Egiin river is the only drainage point from spectacular Lake Khovsgol, one of the largest freshwater lakes in the world. The Egiin eventually joins the Selenge. It is well known among fishermen as a good place for Taimen, the famous salmonoid fish of Mongolia and Siberia. The Delgermoron is another headwater of the Selenge, it flows through the town of Moron before joining the main river. The Tsagaan-Us river flows from the Tavan Bogd moutains in Western Mongolia, watering the odd yak before flowing into beautiful Khoton lake. Khoton lake is a feeder lake of the Khovd River. The Pacific Ocean Basin is formed by the Khentii Mountains, which surround Ulan Bator. Rivers on the west side of the Khenti mountains (such as the Tuul) drain into the Selenge Basin, while those on the other side flow across Eastern Mongolia. 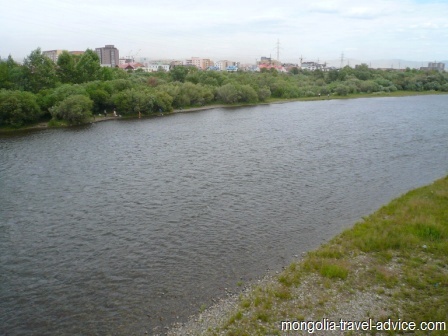 The Onon River is the only river in Mongolia which consistently drains into the Pacific Ocean. The Onon forms in the mountains east of Ulan Bator -not far from the source of the Tuul river, but flowing into a different watershed. Most historians agree that Genghis Khan was born and raised along the Onon river in the Khentii Mountains, for this reason the Onon is considered one of the most sacred rivers in Mongolia. The Onon flows north-east into Russia before joining the Shilka river, then the Amur River. The Amur River (or Heilong River, to the Chinese) forms the border between Russia and Chinese Manchuria before flowing into the Pacific ocean. The Onon is the ulimate source of the Amur River, and the Onon-Shilka-Amur system is the 10th-longest river system in the world. The Kherlen river forms near the Onon and also flows east, but lies further to the south and eventually drains into Lake Hulun in Chinese Inner Mongolia. Lake Hulun usually forms an end-point for the waters of the Kherlen to evaporate (i.e. an endorheic lake), but in very wet years it can overflow and the spillage drain into the Amur river basin to join the waters of the Onon. The Eastern city of Choibalsan lies along the Kherlen. The Chuluut river in Central Mongolia is popular with local and international fishermen. Unfortunately it was flooded when I visited: too dirty for fishing! The Central Asian Internal Basin is a low-lying region covering the Gobi desert in the south, and the Great Lakes Depression in Western Mongolia, which lies between the Altai and Khangai Mountain ranges. The lakes in the central asian basin are generally very wide and quite shallow. The rivers in Mongolia flow into these saline lakes and deposit further salts and minerals before evaporating. The Great Lakes Depression is a low-lying region in Western Mongolia which contains a string of salt lake basins. The Khovd river starts at beautiful Khoton and Khargan lakes in Tavn Bogd National Park before flowing into Khar-Us Lake (or Khar-Us Nuur, in Mongolian). The Khovd is the most significant river in Western Mongolia; it is often colored white with glacial silt from the mountains, and flows through the aimag capital of Olgii. The Zavkhan river flows into Khyargas Lake, one of the major lakes in the Great Lakes Depression area. Uvs Lake (Uvs Nuur) in north-western Mongolia is the largest lake in Mongolia by area (while Lake Khovsgol is the largest lake by volume). It's practically an inland sea, but over 4 times more salty. There is little life in the lake itself but the surrounding Mountains make it a reasonably scenic destination. Into Uvs Nuur drains the Tes River from Russia, as well as a number of small Mongolian rivers. For some reason, the Lonely Planet lists Uvs nuur, Khar-Us and Khyargas Nuur as traveler's highlights of Western Mongolia. But really they're barren, windswept, and not even very appealing for an overnight camp. The reedy sections would appeal to birdwatchers, but other travelers shouldn't go too far out of their way to see these lakes. 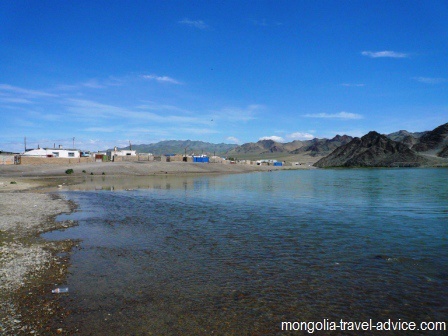 Ulaan Nuur is the largest of several lakes in the Gobi region and is served by the Ongi river. Other smaller rivers draining south from the Khangai Mountains drain into similar salt lakes in the Gobi. In a wet year these lakes can suddenly fill into large inland seas, but in drier years the rivers that feed them can simply dry out on the harsh desert plains.